Before you put your home up for sale, make sure you identify the success rate for home sellers like yourself. This will help you prepare your negotiation stance to mirror your market position. And if you don't think this is important, then you will likely be like the 41% of home owners who failed to sell their home last year! In order to calculate the success rate for home sellers with homes similar to yours, you first have to identify the areas and homes that truly are/will be in competition with you when you list your home for sale in Tallahassee. To give you an idea of how the overall looks right now, I have included a real estate graph below that measures the success rate for home sellers in all price ranges for the entire Tallahassee real estate market (Leon County). To create this graph, we measure the number of homes leaving the market every day. Ones that leave due to failure (expired, withdrawn, canceled) are shown in red, while the ones that leave due to success (sold) are shown in green. As you can see, the Tallahassee real estate market is enjoying the best success rate in more than five years. Unfortunately, the real estate graph above shows all price ranges and all areas in the Tallahassee real estate market. You should not assume that your price range will fall right into the "average," as some are doing far better, while some are doing far worse. Homes at the very top of the market are not doing very well at all, thus if you find yourself in such a highly competitive price range and/or area, you need to be prepared to compete. A great listing agent, with a great internet marketing plan for selling a home is now a must. You could leave 10 to 15% of your home's value on the table if you fail to reach the best buyers in the market. Interview multiple agents, have them demonstrate to you the current success rate for home sellers like you, and then hire the one that has a proven success rate for homes like your own. 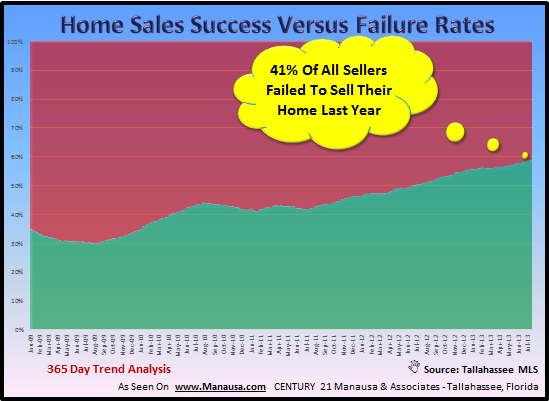 If you would like to know the success rate for home sellers like you in Tallahassee, just drop me a note and we can schedule a time to review your exact market position.